Eye of a hurricane, listen to yourself turn, world serves its own needs, dummy serve your own needs. 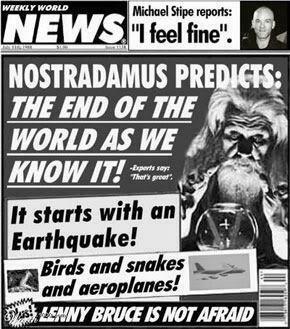 It's the end of the world as we know it... and Michael Stipe feels fine. I'm really curious to see how the world ends with birds, snakes, and airplanes. Also, it wasn't until I got to the Lenny Bruce part that I finally got the joke of this cover. Very clever. I have had it with these end-of-the-world snakes on this end-of-the-world plane! I find it funny that almost every single comment about the end of the world is extremely sarcastic. I was going to say this, but Nukaya said it first.